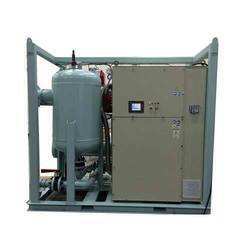 Pioneers in the industry, we offer condensate heater and waste heat recovery system from India. Installation of our unique Vijay Condensate Heater along with well engineered flash heat recovery system can bring down the steam demand to 33-34 % for sugar process compared to 41-42% on cane in standard sugar plant without any Compromise & complications in process parameters & system. This proven simple system has improved final sugar quality, extraction efficiency and overall capacity of plant at low investment with unimaginable viability. The principle adopted is the primary heating of raw juice using conventional juice heater by low temperature vapors is carried out by vapor condensate after flashing to gain potential and further intensive bleeding to result maximum steam economy. Our liquid to liquid counter current tubular condensate heater uses vapor condensates only after flashing to heat the raw juice to 70 -72 deg C with a stand by provision of one segment for cleaning . Identical type feed heater recovers exhaust condensate heat by preheating of clear juice to gain steam economy & avoids loss of pure condensate due to flashing with proper sealing at high pressure end in simple way. Our well designed flashing system operates & handles entire condensates by 3 numbers of identical pump sets with elimination of more number of smaller size pumps to gain electrical power and maintenance cost end. The system can be incorporated even for evaporator section installed at 6000mm.Addition of our direct contact heaters for further improves economy of plant by recovery of waste heat from clarifier, filter vapors, Juice & evaporator ammonia vapors. 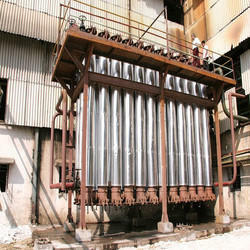 Lowest steam consumption of 33 -34 % for entire sugar process. Complete elimination of medium pressure steam for sugar operations. 99 – 99.5 % pure exhaust condensate back to boiler at 100 – 102 deg C.
Simpler system identical to operation of conventional juice heaters with easy supervision, highly reliable and repeatable. The separate second effect vapor condensates circuit enables for use of cooling tower make up after conditioning and reduces pollution load for CO-generation plant. The low temperature of excess vapor condensate at 45 -48 deg C is directly and easily handled as dilution water for treated sugar factory effluent (or) directly used at distillery. Low investment with assured shortest pay back of below one normal sugar season. The system reduces steam & power demand in boiling house and increases plant operating capacity with best quality sugar out put with higher extraction efficiency. We have already installed this system successfully at Shri Khedut Sahakari Khand Udyog Mandli Ltd., Kosamba, Tal.-Hansot, Dist.-Bharuch (Gujrat) – India. Up-till now, a separate steam line of 100 PSIG saturated steam is brought up to the Sulphitation for the purpose of heating & melting the Sulphur burner. It is observed that due to poor control of pressure and De-superheating the steam, Temp available of pressure for melting is not effective. Excellent source of saturated steam. Synchronized with the burning capacity of the Sulphur Burner. Non-uniform flow of molten Sulphur in to the burner. Variations in the So2 generation in the Sulphur burner. Jamming of hopper & Feeder Valves. Stoppages of mill and other process due to non-functioning of Sulphur burner. We are all aware of the critical role that the sulphitation plays in production of white sugar. Considering this situation, we have developed an automatic system for efficient melting of sulphur in the melter and maintaining it in liquid from the melt receiver of your Sulphur burner. This system generates saturated steam specifically for the Sulphur station. It is equipped with automatic temp. and pressure control panel for superior control. The Design of the system is such that it re uses the condensate of the melter and melt receiver. This reduces the quantity and power required for the generation of the steam. Transmission Index of Juice improved by 10. Looking for Technology Innovative Products ?